Receive national recognition for your education design projects! Good designs are based on exhaustive research and the study of best practices. 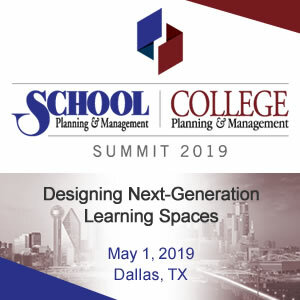 To help provide this information on what makes a “good” space for learning, School Planning & Management and College Planning & Management established the Education Design Showcase in 1999. It is a vehicle for sharing innovative, yet practical, solutions in planning, design, and construction. The goal is to share ideas that will help us achieve the best possible learning environments and to recognize the firms that have made these ideas a reality. Projects (New, Renovation, Addition, and Adaptive Reuse) must have been completed after January 1, 2016. Projects entered as “Design Concept” must be under contract for construction on or before May 1, 2019. The jury will select two GRAND PRIZE winners – one from the pK-12 categories and one from the higher education categories – as well as HONORABLE MENTIONS in any category. All other projects selected by the jury for publication will be designated as a PROJECT OF DISTINCTION. WHO WILL SEE MY PROJECT? SP&M/CP&M are industry-leading publications for decision makers in the pK-12 through college/university facilities market including: Superintendents; Presidents and Chief Administrators; Boards of Education; State/Federal Departments of Education and State Higher Education Agencies; Business and Purchasing Officials; Facility Planners; Energy Managers, Physical Plant, M&O Directors; Student Housing; Safety & Security; plus Architects, Engineers, Interior Designers, Construction Managers, Integrators, and Consultants. Those who will see your project include your peers, your clients, and potential clients for your firm. Download the Portfolio Packet and Entry Form. This document provides detailed instructions on submitting your project materials for consideration. The Final Date for Entries is May 6, 2019. Portfolio materials are due by May 10, 2019.